When we chose 89-year-old Barbara Singer as the cover model for this issue, we were drawn to her lively, expressive face, the glint of humor and intelligence in her eyes. And yes, the cool glasses, too. 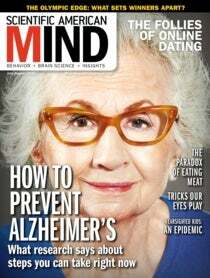 Little did we know she was a perfect fit for our cover story about how to keep Alzheimer's disease at bay. The article was written by neurologist David A. Bennett, director of the Rush Alzheimer's Disease Center in Chicago. For nearly 25 years Bennett has overseen two major, longitudinal studies identifying factors that appear to offer a measure of protection from dementia—or at least slow its encroachment. The results, which reflect data from more than 1,350 brain autopsies—show that there are things all of us can do to stockpile “cognitive reserve,” a surfeit of brainpower that, as Bennett writes, “[makes] our brain less vulnerable to the ravages of aging.” These include acquiring more years of education, eating right, learning a foreign language, staying physically and socially active, and retaining a sense of purpose in life. Singer does it all. She exercises, eats right and brims with purpose. Modeling and acting (recently in a Woody Allen project) is her third career; she had been an x-ray technician and photographer. Devoted to learning, she has taken philosophy classes and consultations at New York City's Aesthetic Realism Foundation for decades. She is also busy promoting the work of her late husband, photographer and poet Nat Herz. “I feel strong enough to keep going for at least another 10 years,” Singer told me. Elsewhere in this issue we explore another aspect of mental and physical staying power—the kind that leads to Olympic medals. In “The Right Stuff,” journalist Rachel Nuwer examines recent research on the mental and physical traits that separate the world's top athletes from the rest of us. In a related story, “How to Coach Like an Olympian,” writer Bret Stetka interviewed sports psychologists to learn what kind of coaching best helps athletes keep their eyes on the prize. Speaking of eyes, two stories deal with our remarkable sense of vision. If you click here, you can feast your eyes—and confuse them—with an array of images and illusions designed to determine how our visual system makes sense of shape and shadow. They are the work of neurologist Chaipat Chunharas and neuroscientist Vilayanur S. Ramachandran, a member of Mind's advisory board. And in “Losing Focus,” journalist Diana Kwon explores the global epidemic of myopia that is predicted to leave half the world needing glasses by 2050. As always, I hope this issue will bring the astonishing power of the brain and senses into sharper focus.